MITRE announced Compass™, a first-in-class, open-source application to collect minimal common oncology data elements, or mCODE™, from electronic health records (EHR), today at the HIMSS19 Global Conference & Exhibition. Only three percent of adult cancer patients participate in clinical trials, limiting access to high quality data across multiple types of cancers. mCODE is a new data standard under development that will facilitate breakthrough insights into high-quality data for multiple cancer use cases. Compass is a SMART (substitutable medical applications and reusable technologies) on FHIR (fast healthcare interoperability resources) application that extracts mCODE data elements from electronic health records to deliver reports to providers and patients - empowering better diagnosis, improved care planning, and shared decision making at the point of care. Most of the nearly 15 million individuals living with cancer in the U.S. have EHRs of some sort. However, many of the 1,500 EHR systems in use are incompatible, limiting the valuable information cancer researchers could pull from these records. 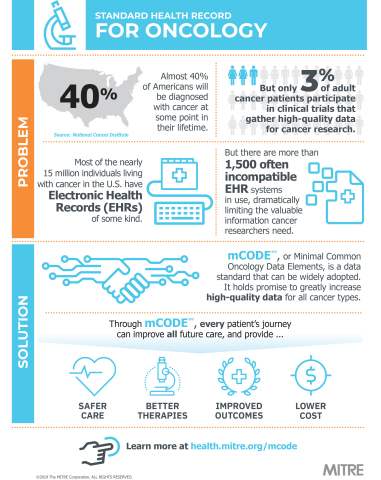 Development of the mCODE data standard is led by the American Society of Clinical Oncology (ASCO), working with MITRE and other stakeholders, to improve data and records interoperability in oncology care and research. An early version of mCODE core elements, reflecting initial use cases, is open for comment and near ready for publication. MITRE and Brigham and Women’s Hospital also announced their intentions to strategically plan for an mCODE implementation pilot at the Boston hospital. Teams are exploring the potential for a research study to demonstrate the benefit of structured data entry, capture, display for front line clinicians. On Tuesday, February 12, Dr. Brian Anderson, and Andre Quina will preview Compass when they co-present mCODE: A Cancer Model for a Learning Health System at HIMSS19. Demonstrations of Compass will continue through Thursday, February 14th at the MITRE kiosk, within the Federal Health IT Solutions Pavilion, Booth 8267-08. MITRE's mission-driven teams are dedicated to solving problems for a safer world. Through our federally funded R&D centers and public-private partnerships, we work across government to tackle challenges to the safety, stability, and well-being of our nation. mCODE is a trademark of the American Society of Clinical Oncology. Used with permission.